Jewish Ghetto Tour in Venice Includes: Services of a Venice tour private and entrance tickets to Synogogue. Closing: Synogogue is close on Saturdays. 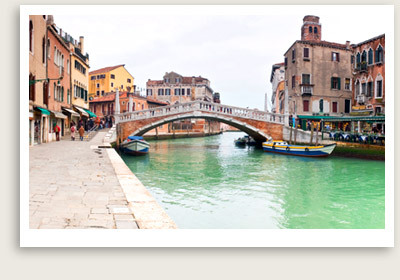 This unique Venice private tour features Venice’s ancient Jewish ghetto, located in the Cannaregio district. This area is one of the city’s most authentic, and yet quite unknown to tourists. In this Venice private tour of the Jewish ghetto, you will see important historical and artistic reminders of the past on this tour, which starts from Rialto, where various foreign communities have lived throughout history. You will continue with the Jesuits’ Square, whose church features an important Titian painting and the small precious oratory of the Crociferi. From the church, you will continue with your tour and pass by the Scuola Grande di Santa Maria della Misericordia and then we walk along the fondamenta (an Italian term for a long street running along a canal or pier) to a small shipyard. You can stop in the nearby church of the Madonna dell’Orto to admire some of Tintoretto’s celebrated works. In this multicultural area, far from the center of power, the Jewish ghetto was born in 1516. Your tour guide will help you to understand what distinguished this area from all other Jewish neighborhoods in Europe at that time, and share with you the history of the Venetian Jews, still an important community here today. This Venice private tour includes a visit to the synagogue, unless of course, it’s Saturday.